On the way home I mused about why I find it so hard to go back. I think my separation from the place throws into relief the feelings of being trapped, stuck and powerless that I had over so many years. I feel cheered by this realisation that Manchester is not a terrible place; it is simply that I was often unhappy in the years I lived there. I am happier now. Over this past year I have felt the happiness came from being in a place that feels so right for me. But perhaps there is another way of looking at it. Perhaps it is not the place so much as my act of choosing it that brings this lightness of heart, this sense of balance and freedom. I am reminded of children’s adventure stories, of those moments when someone crosses into another world. There is a magic in the curiousity, faith and courage that take someone over a threshold into an unknown future. When we choose freely and step forward in hope, we claim some of that magic for ourselves. I wrote this post back in April about some of the same set of feelings, though I didn’t see them so clearly then as now. This is my 100th post. Nine months ago we moved ‘from the city to the edge of the Lincolnshire Fens,’ as it says in the strapline above. Heckington is indeed a village on the edge. 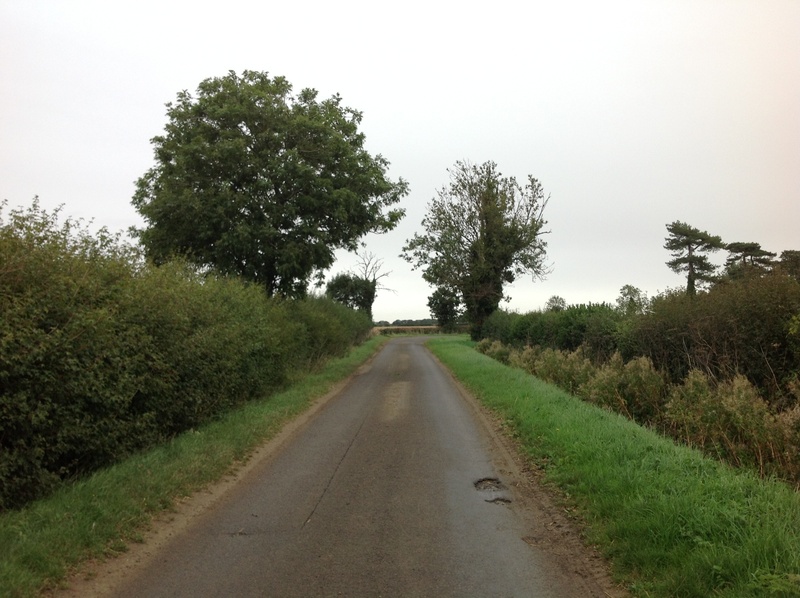 Sitting at a fine height of ten metres above sea level, it is one of a string of villages which mark the western border of the fens in these parts. To the west of these villages is a very English farmland landscape: an undulating patchwork of fields and hedgerows in shades of green, brown, gold. But when you travel east you cross the 5 metre contour line and then, on the map, there are no more wavy contour lines, just the straight, blue lines of drainage ditches dividing the fields. Each village has its own parcel of fenland: South Kyme (South Kyme by Ferry Lane), Howell (No longer the dog field..), Heckington, Great Hale, Little Hale and so on, along a roughly north-south line down to the town of Bourne, each with a fen named after it. These are the real flatlands, a pancake-flat, sea-like expanse stretching from here to the Wash. Long, straight farm roads or ‘droves’ take you out onto the fen, often coming to an abrupt end at Car Dyke (A walk on Star Fen) or further south, at the larger, though less ancient South Forty Foot Drain. Yesterday I walked at twilight down Howell Fen Drove, picking elderberries, meeting not one other single soul, hearing nothing but the wind and my own footsteps. Ahead of me hung a three-quarters moon in a limpid, china blue sky, behind me cloudy pink reflections of the setting sun; light fading with every yard. The eerie, empty world excited, elated and then scared me as the darkness grew. I though of Robert Macfarlane walking a sea path in mist (in The Old Ways) and then I was on another ghostly walk, from Alan Garner’s The Moon of Gomrath (a childhood favourite), with padding footsteps of the Horned Hunter behind me on the road. So that road’s end is to be seen another day. I turned back to my real-world, parked van and the dubious safety of driving home in darkness with my less than perfect eyesight. But I am glad for that hour out of time on a road to nowhere. Part of me is walking there still, weightless, breathing, free. It’s been a busy week, including a short visit from two-year-old granddaughter sans parents. Great fun – and full on, as they say. Handed her back at Doncaster station rendezvous on Friday; then I was off to my placement to do a mediation. By the time I had retrieved the van from Grantham station and was driving home I was very tired. So I turned off the main road earlier than usual and drove very slowly along narrow country roads, getting out once or twice to take a photo of fields. 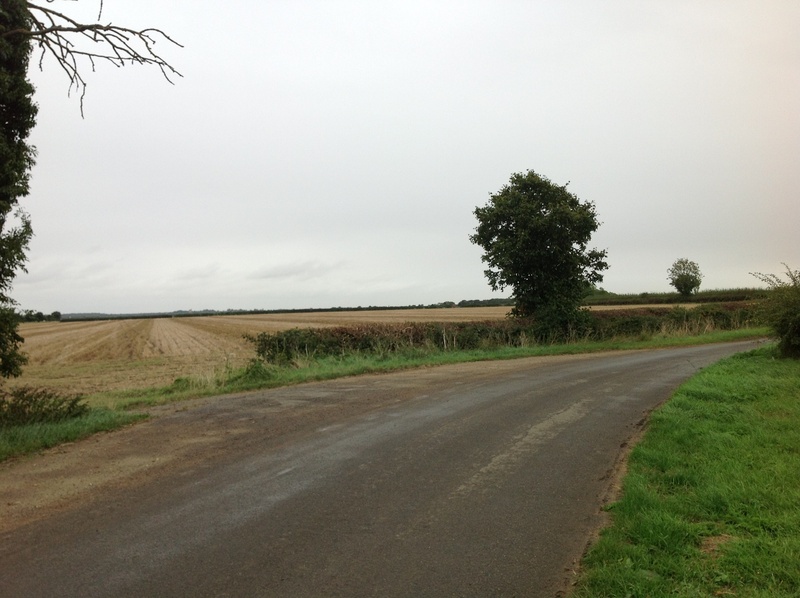 This picture is taken from the road into Heckington from the nearby village of Burton Pedwardine. 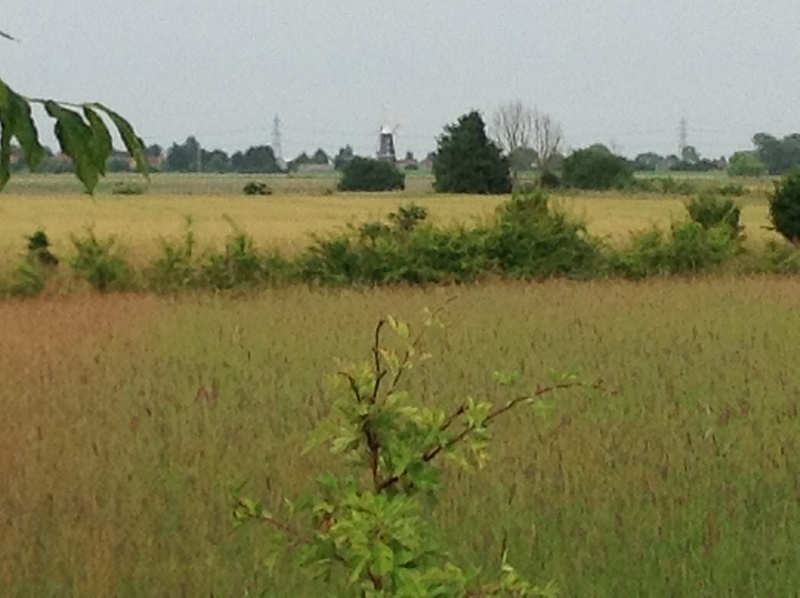 In the distance you can see Heckington Windmill. 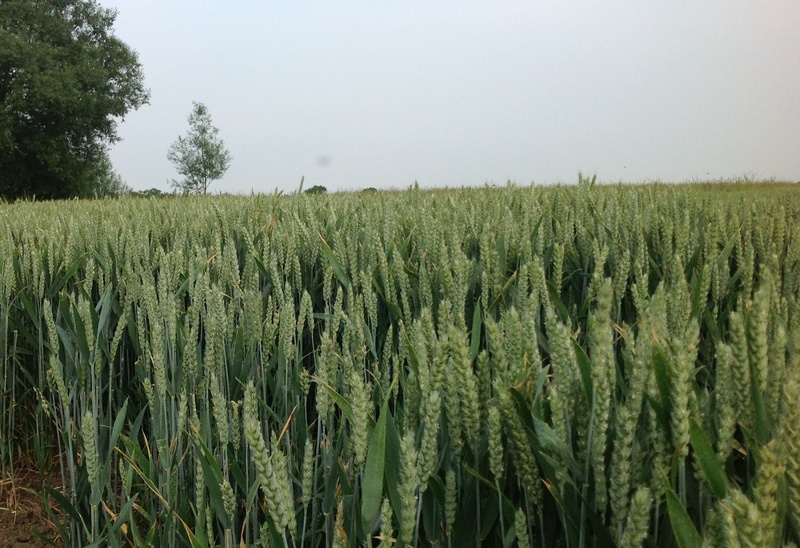 Fields of wheat are like a green sea stretching out to the far horizon; close up you can see each individual plant, each ear of grain. They remind me of looking at Antony Gormley’s Field for the British Isles at the Tate in Liverpool some years ago. Hundreds of little clay figures spread out to fill a whole room, like a field or a sea. Yet each is a unique figure, the whole seems a metaphor for humanity; we are a mass and within the mass each individual is huge, complex, unique, valuable. It is too much for my poor brain to contemplate on this particular day, the vast and the minuscule; vertigo brought on by corn standing in a field. 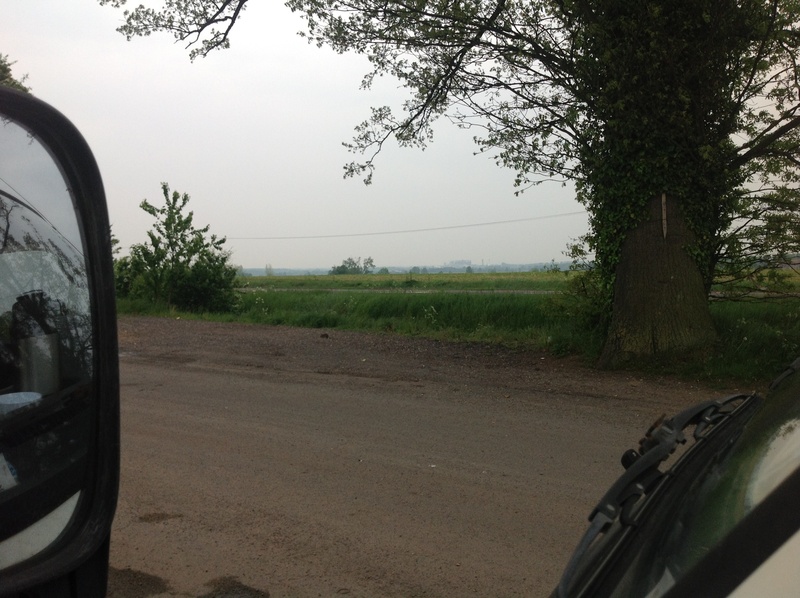 Here is England, seen fleetingly through the van window, from Heckington to Manchester and back again. We pass fields of sheep and steelworks, cranes and turbines, service stations, farm shops, church towers heading for heaven, footpaths winding off the page. We travel across England’s middle, through green England, tarmacked England, under impossible, painted skies of blue and white and thunder-grey. And as I look out, and when I remember it later, writing these words, I can taste the green and the rain and the grit and I could eat it up, it’s so good. At the M1/M18 junction. Great sky, great turbines, nearly missed them.. The open road: brief spell on the M1, heading south. To Suffolk on Tuesday to see aunt and cousins. Enjoyed the three hour journey in campervan through a rural landscape that moved from pancake-flat fenland to low, rolling Norfolk hills. And now am on my way home again. 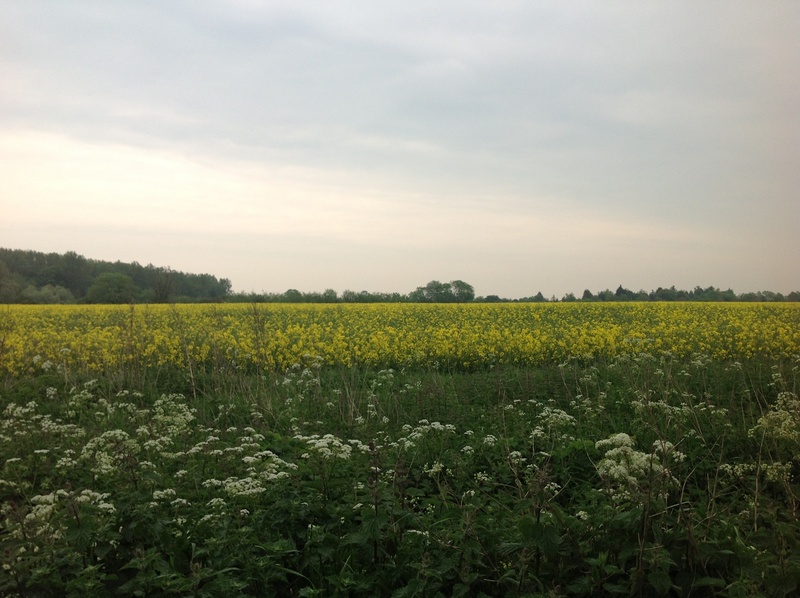 Here was my coffee stop, somewhere near Thetford – noticed the field colours like the ones in my last post, the picture taken by friend on Star Fen. So great to see so much green at last. I love all these fields, trees, hedgerow, cow parsley, reminding me of childhood summers. For many, many years we have had a big dinner on New Year’s Eve with lots of friends and lots of courses. The largest number of people, in 2004, who sat down to eat was eighteen. Once or twice, in our last and smallest house, we were only six or seven. Tonight we will be four, just us and good friends from Essex who have been stalwarts of the Manchester dinners and will now share our first new year dinner in our new home. This time last year we ate smoked trout and tapenade, chestnut and celeriac soup, rib of beef, mushroom and nut roast, cheese and spiced pears, apple creme caramel. It’s been a big year, full of change. Partner had big birthday, our second granddaughter was born, we bought a campervan and biggest of all, we moved to the other side of the country. Tonight we will think of all of you who have shared new year and other special occasions with us in the past – especially last year’s New Year’s Eve and partner’s birthday in the spring. You know who you are. Wishing all our friends and anyone else reading this a very happy new year and all the very best for 2013. It’s proving hard to say goodbye, though I’m longing to be gone. I will miss kind, funny, clever, lefty friends and neighbours, good food shops, the allotments, nature reserve, lovely dogs and dog walkers, friends at the farmers’ markets and the brilliant tram. I won’t miss the noise and traffic, nor the grim, outrageous poverty that spreads over so much of the city outside our comfy suburb. I don’t want to be here when the going gets tougher. Meanwhile, more prosaically, the cardboard boxes are piling up ever higher around me and there still seems to be stuff everywhere.